First available in 1986 from the United States Mint, the 2011 American Eagle Gold Bullion Coin version offers investors an opportunity to purchase a coin based on the value of the content of the gold contained within it. Normally, a coin's value is derived from its limited mintage, rarity, condition and age. These Gold Bullion Coins are available in four denominations: one ounce, one-half ounce, one-quarter ounce and one-tenth ounce. They carry a face value of $50, $25, $10 and $5 respectively, but of course, as mentioned before, their true value is dictated by the value of the gold they contain. A small premium is added to the gold price to cover minting, distribution and marketing costs. Unlike other coins produced by the US Mint, the Gold Bullions are not available for sale directly. Instead, the mint utilizes a system of wholesalers, brokerage companies, precious metal firms, coin dealers, and participating banks. These "Authorized Purchasers" are then responsible for sales to the public. As part of the American Eagles collection, the content, weight and purity are guaranteed the the United States Government making them attractive as gold investment instruments to many. 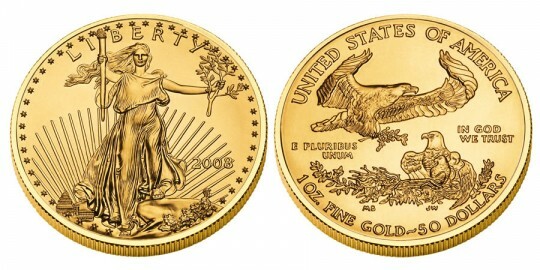 For reference, the US Mint recorded a total of 1,125,000 of the 2010 One Ounce Eagle Gold Bullion Coins sold, 81,000 of the half ounce, 86,000 of the quarter ounce and 435,000 of the tenth ounce. Based on the Augustus Saint-Gaudens design originally used on the $20 Double Eagle in the early 1900's, the obverse of the Gold Bullion coin shows "Liberty" with a torch in one hand and an olive branch in the other. Also visible is the capitol, the year, and the word "LIBERTY". The reverse features a design by Mrs. Miley Frances Busiek that showcases a "Family of Eagles". Also included are the words "UNITED STATES OF AMERICA", "E PLURIBUS UNUM", and "IN GOD WE TRUST". The amount of gold content and its corresponding face value are shown as well.